I guess the babies got tired of waiting. They came into the world last night. Mom and all ten little ones are doing fine. I do wonder though, why do the mothers always use the soiled bedding for their nests? I just leave it to them, they know what they are doing. Fresh bedding was added to her pen. She will shred it and make a big straw blanket for the piggies to nestle into. They will be snug and warm next to mom. Char is a feisty mom. She would like to take a bite out of anyone, even the fat guy who feeds her 😮 I think we sorted that out today. I like a good mother and protective instincts is something I look for in my herd moms. Ornary, contrary moms are sent to freezer camp, but the ones who look out for their babies are cherished. Another sow waits in a large pen nearby. Her time is also short for playing the waiting game. 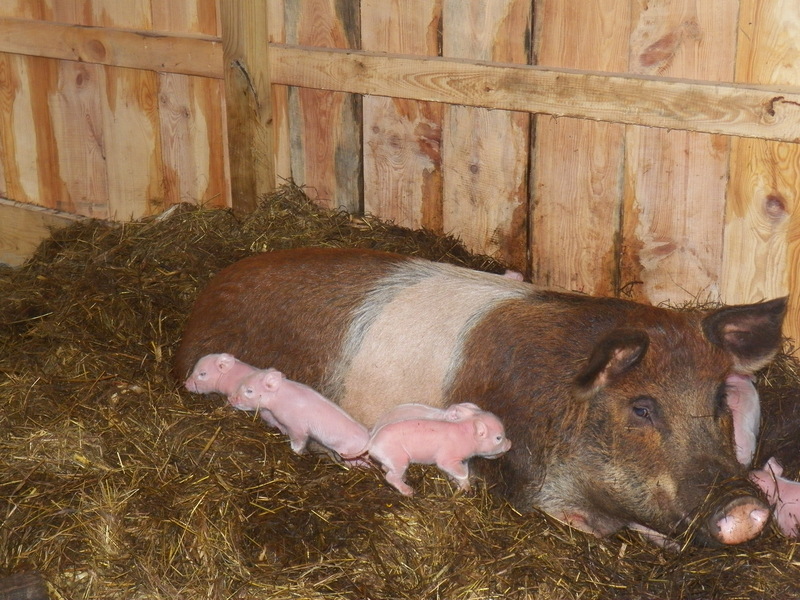 I am sure in the next few days, more babies will be born on the farm … until then….. we just wait. I snapped this picture early this morning. 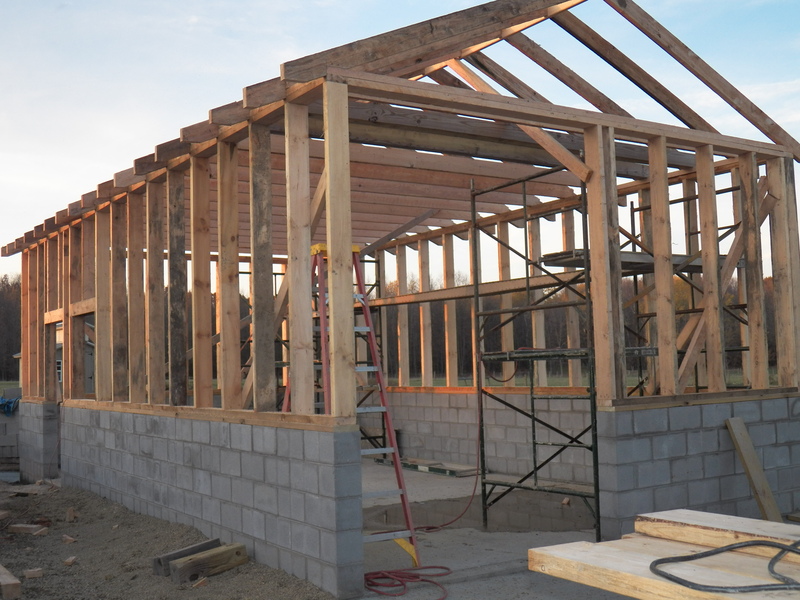 The wash-house stands ready for steel siding and roofing. We just have to wait on the weather. The rain from “Sandy” is supposed to soak us for the next week. We will wait and rest easy, because all is ready. The rains have been falling since last Friday evening. The ground is getting saturated. Our back pond is full. Water is spilling out the overflow for the first time since last May. Our drought is officially over and harvest everywhere near us, has ground to a halt. I stumbled around in the dark this evening looking at things that must be done before winter. I feel pretty good, but there are a few jobs that must be attended to before the puddles become ice. Our momma pigs are very pregnant. I think the upcoming storm coupled with the full moon, ought to be enough for them to deliver their babies. There is a damp chill in the air, making everything on the farm start to think about winter. 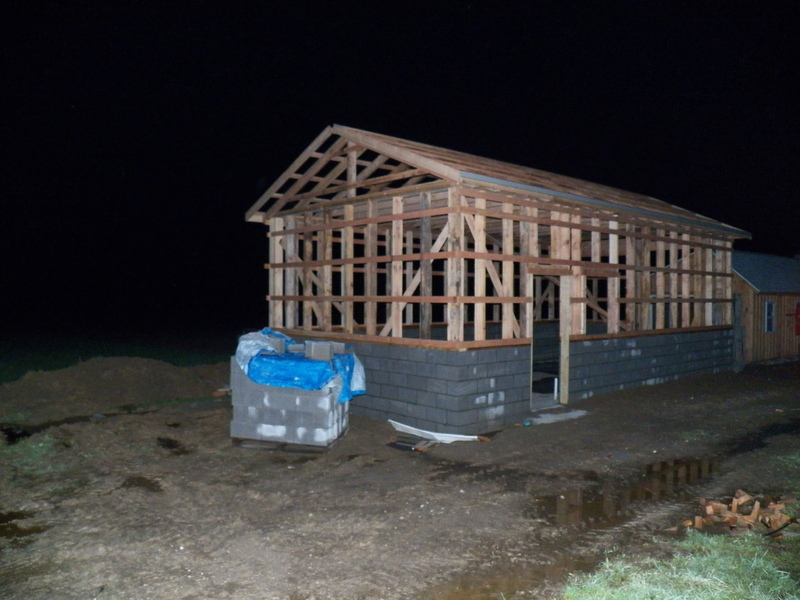 After a good early start and a finish at sunset, we got the wash-house framed in. It was a tiring day, but satisfying as well. The prep work we did in the rainy days of last week paid off big dividends today. We had pre-cut the wall studs last week. Justin was in charge of that job. He took it serious, was careful and did an outstanding job. We had the stud walls up just after lunchtime. The ceiling joists and rafters took us until sunset. Much of this lumber was milled from our white pine trees. We did buy a little bit of hemlock lumber, but the rough cut wood worked out very well. The costs savings will be added up later. It does take a little longer, because you have to square up every board before using it. One end gets squared, the other gets cut to length. I will say, that by the end of today, I am glad for the strength of the 2×6″ lumber… but sore from lifting it all day! There is still much to do, but the project is well underway. I hope to have it closed in before the bad, winter, weather hits. King … the yucky creek wader! The other day, King had to go to the vet. He was due for all of his booster shots. He is a little over a year old now. I bathed him the night before with pet soap and a little “Skin-so-Soft”. He looked and smelled great. Once we got home, it was off to the fields for chores and work. King raced ahead and ran quickly to the small creek, that is the back ponds overflow. There is not much water there, but wow, is the mud deep. 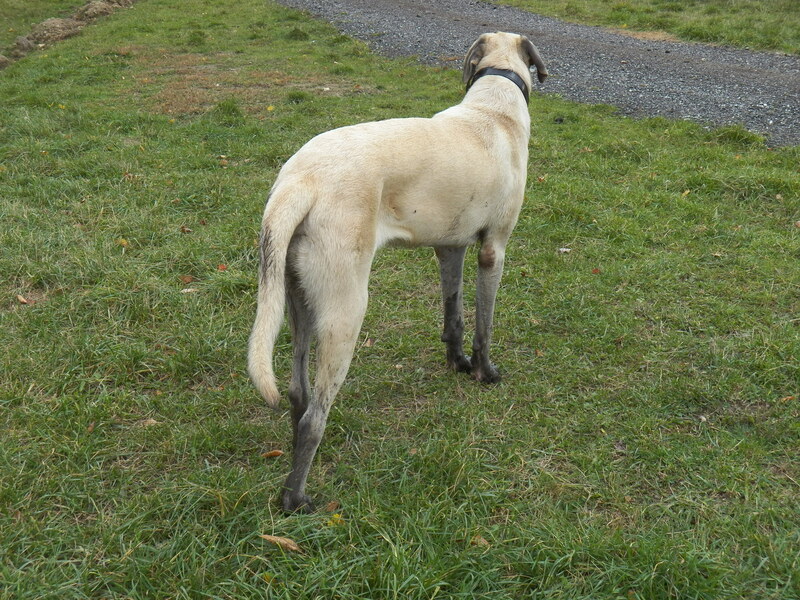 King walked up the creek, then promptly laid in the mud. His side, not in the picture, is covered in black sticky goo. When I called him over to take a picture, he wanted to rub that creek slime all over me! I settled for the photo that you see. I rinsed him off with a hose, as he looked at me the whole time, like a little boy … as if to say, “It’s just a little mud!” Jeeeze! I don’t care how many times I look at the sugarhouse, I am still tickled. It was a dream that took a long time to come true. I had a lot of folks pulling for me and a deep sense that I must have one. She stands like a testament to love and hard work. I am proud of her. The sugarhouse stands for much more than a building to me. It is a pathway to the past. Some of my fondest memories involve a sugarhouse. The smell of the boiling maple sap brings those memories flooding into my mind. My parents and grandparents would be so proud of this part of our farm venture. 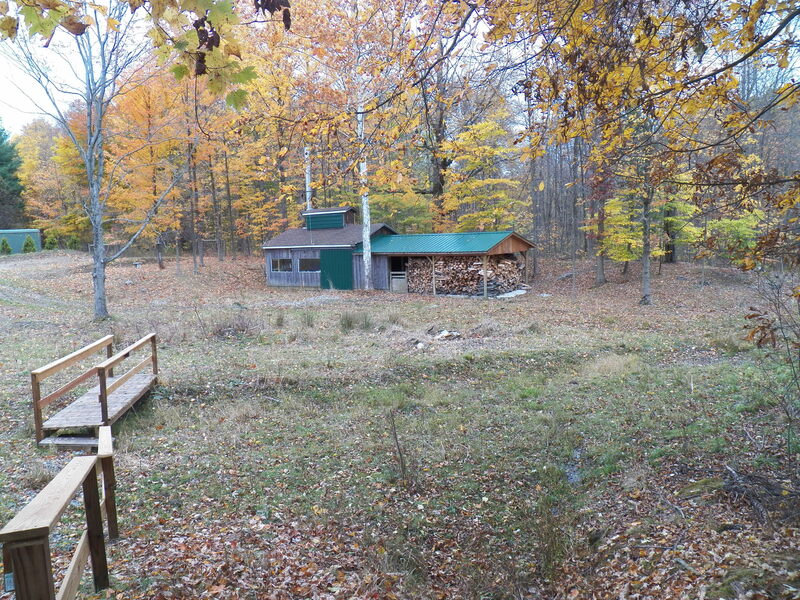 I think that is why I feel so good every time I walk by that building nestled against the hill, next to the woods. It is a lot of work making maple syrup. I can honestly say that the feeling I get, is one of pure pleasure. There is no work for me at all. I enjoy it so much, it is like a vacation. The hot steam takes the place of a sea mist. The white snow covered landscape is like a sandy beach. The peace that fills me could not ever find me anywhere other than when I am in that sugar camp… yep… I’m still tickled! It’s hard to believe, that in just four months, it will be maple syrup time. The leaves are falling at a quick pace now. The trees are almost bare. The days are getting shorter. Soon the landscape will be a blanket of white. The time change has been moved to November. I wish they would just simply leave it alone. All that springing ahead and falling back makes me dizzy. I don’t think it makes much difference anyway. It just adds one more layer of confusion for no reason. The children get bussed to “bigger and better” schools now. They have to leave in the dark no matter what the calendar says. The shorter days and leaf covered walkways remind me of my days back in school. I had a good time, learned in spite of myself and couldn’t care less about what time it got light outside. It seemed the evenings were always too short to get all my playing done before dark anyway. The state of Indiana doesn’t change their time. They don’t have to spend two weeks or more a year switching milk cows from daylight savings time to eastern standard and then back again. They just go with the flow. I think there is a lesson there. It can be said that I am resistant to change. I agree. I farm with horses, enjoy hard work and need to be in touch with soil. When something gets changed just for the sake of doing something different, I don’t like it. Okay, it’s the wrong holiday, but no one told the turkeys! They were having a great time out in the speltz field until they spotted our dog. Then they ran for the gate, but couldn’t figure out how to get through. 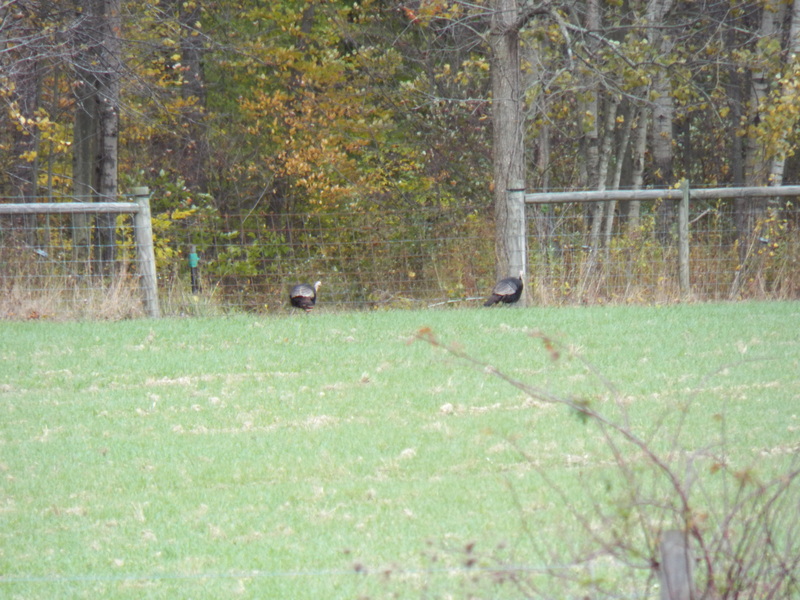 It was funny watching them run back and forth as they tried to figure out how to get on the other side of the fence. One of them must have suddenly remembered that they could fly. All of a sudden, they were in flight and gone. Autumn brings everything out looking for food. They are trying to lay in some extra fat for the long cold months of winter. The squirrels are busy gathering nuts and wild geese glean fields for any bit of dropped grain. 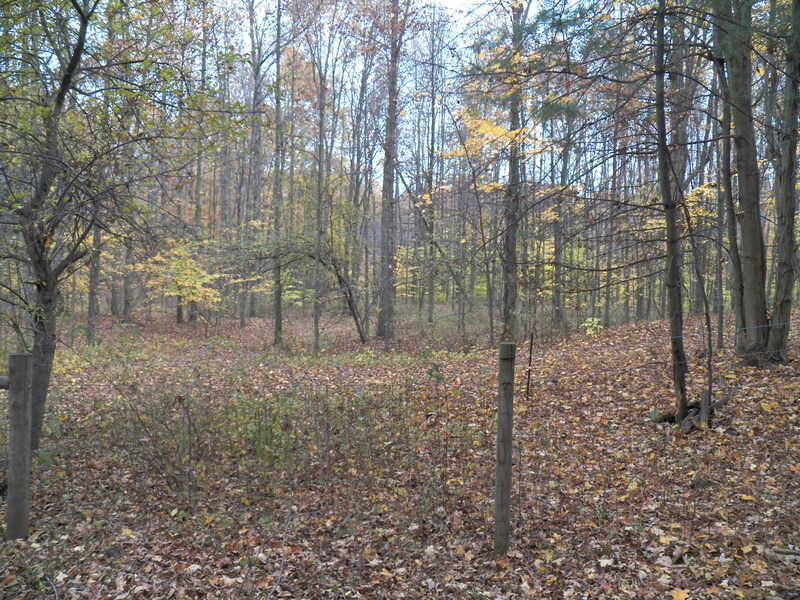 I have to get my building projects completed so I can spend a little time hunting the white-tailed deer. I enjoy hunting. I am glad that soon, I will get to spend some time engaged in that pursuit.